Morning protein shake = cold brew coffee + 1.5 scoops chocolate protein powder + 1 scoop collagen powder in shaker cup, then add ice! Athleisure is a bandwagon that I am currently driving. Did I sleep in these clothes? Did I work out in them? Or did I just go to the store? The world may never know. I asked Stitch Fix for some specific articles of athleisure type clothing and they sent the PERFECT items. I wear these clothes way, WAY too much. They're comfortable but a little more put together than yoga pants and a t-shirt. John Striped Cardigan ($48) -- SO SOFT. Ridiculously soft. Neutral. Great length. (Covers my rear, I'm 5'4" for reference.) Can dress it up or down. The perfect cardigan. Teighlor Slim Fit Drawstring Jogger Pant ($78) -- Again, crazy soft. Thick enough to be legit pants. They are more expensive for a good reason -- these are NOT your typical joggers. The quality is superb. They have such a smooth, soft, luxurious feel and I can tell they'll hold up for the long haul. Jesse Crossbody Bag ($48) -- The only bag I carry when I'm not using a diaper bag. I love the size and it goes with everything. Voice Zip Sneaker ($69) -- Comfortable, but a step up from normal sneakers. I was wary of requesting shoes but even though the first pair they sent me didn't fit, I was able to easily exchange them for a different size. Accalia Anorak Jacket ($128) -- Exactly what I was looking for in a new jacket. Super versatile and I love the olive color. This also looks amazing dressed up with jeans and heels. It's a waterproof material which makes for a stylish raincoat as well. As I've said in the past (like in this past review) it helps to be really specific with your requests. I tell them exactly what I'm looking for and pin what I like on my style board. Sometimes they've sent me exactly what I've pinned! Although the prices can (but don't always) run higher than I would normally spend, I don't mind that for a few reasons. Firstly, it takes the time and effort of shopping out of the equation (I also just dislike shopping in general). Secondly, the quality is excellent. I've gotten some of my most loved and most worn staples from them. Lastly, I'm just gonna be up front here -- I save up referral money for this. That's an awesome part of Stitch Fix -- after you get your first one, you then have your own referral code and can get $25 for EACH person who tries it after you recommend it to them. That's a pretty sweet perk and can add up quickly. Have you gotten any great athleisure pieces from Stitch Fix? How I Store & Print my Photos + FREE Chatbook for you! One of my goals recently has been to overhaul my photo storage and printing situation. Especially since having kids it has been kinda overwhelming and ridiculous how many photos I have and how they are sitting on my phone/computer doing nothing. I want to actually ENJOY the pictures. Here is the process I've found works best for me. I store all of my photos in an external hard drive organized by years, then months, and then specific holidays or events within months. I have a separate iPhone folder under each month. I try to upload photos at least monthly. The key is to carve out enough time to DELETE photos when I upload. It can be difficult to delete, but I pick some favorites to edit and save and then get rid of the rest. Judah is not going to want to go through 57 photos of himself sitting in front the Christmas tree making different faces someday. It's also helpful to keep a folder going of ones you definitely want to print. I have one called Gallery Wall where I am collecting photos for a gallery wall I am planning for our office. It's good to be specific with your folders! When my family gathers at my grandparents' house we inevitably go through old photo albums at some point. This is what I want to be able to do with our photos! Not just on a screen. But I also want the process of creating the albums to be as SIMPLE as possible. Chatbooks is my solution to this. It honestly doesn't get easier. You can sign up to receive a Series and they will automatically send you photo books WITHOUT YOU HAVING TO DO ANYTHING. It is truly magical. And only $8 for a 60 page book that is great quality. All you do is link up your Instagram account and once you post 60 photos they will send you a book of them. If you want to edit which photos that are included you can definitely do that (and they will notify you before they send the book) but you don't have to. I decided to make a separate Instagram account solely for Chatbooks photos. Then I know exactly what is going to be included (just personal family photos) and I can make the captions how I want them for the book. I also don't post certain kinds of photos on my public account, so this separate account is for my eyes only. It sounds complicated but it's super easy to switch over to another account on Instagram and add photos. You can also make custom books through Chatbooks for up to 365 photos. I made one for 2016 and it was the least frustrating process for making a photo book I've ever done and I'm SO pleased with how it turned out. If I am printing larger photos to frame I use mpix -- awesome price point, quality, speed of shipping, and customer service. I love having square Instagram prints hanging in my kitchen and to stick in the boys' baby books. I am not fussy about their baby books -- I basically just tape printed Instagram photos in them and try to write some updates monthly/after doctor visits. If you need Instagram prints extremely quickly and cheap, you can easily get them from Walgreens. BUT the quality is definitely lacking. Chatbooks offers easy Instagram prints that are also excellent quality, 24 for $12. It takes NO TIME to order them from their app and you can get prints from your phone, Facebook, Instagram, etc. Select photos, crop if needed, optional white border, done. It took me a while to jump on the Chatbooks train for no good reason, but now that I did, I love it. It truly simplifies that part of my life and is one less thing to take up mental space. To get your FREE BOOK use this link! 2. A is for Apple (Trace and Flip) -- Judah LOVES the alphabet and this book has cultivated that love. It's the best simplified ABC book that I've found. Each page shows the capital and lowercase letter and two things that begin with that letter (one hidden under a flap!). It has arrows for the child to trace their finger over the letter. Judah will sit down unprompted and go through this entire book by himself. 3. Goodnight Moon -- Classic and a best seller for a good reason. The pictures are easy to look at and Judah loves to find the little mouse on each page. 4. Dr. Seuss's ABC -- I have this book completely memorized we have read it so many times. Such a fun rhyming book that you can almost sing as you read it. 5. Chicka Chicka Boom Boom -- Another alphabet book, but very different. At first I thought this book was a little strange. But as Judah got a little older he started to be crazy about this book. He asks for it every day. The very last pages have the whole alphabet on them and he loves to point at the letters as we sing the ABCs. 7. Where's Spot? -- A classic lift the flap book that is super entertaining for Judah. 8. My Big Word Book -- This one is the updated version of the one we have but it is such a great word teaching book! 9. The Very Hungry Caterpillar -- Judah loves the holes in the book and all of the counting. 10. Baby Einstein 12 Board Book Block Set -- A set of tiny books that don't have plots or anything but Judah loves them and they are so handy to have. 11. Moo Baa La La La -- This book cracks Judah up and is another adorable one from Sandra Boynton. He loves to say all of the sounds the animals make as we read it. 12. Who's At Home -- A unique flap book, this one goes through woodland animals and where they live. 13. Little Blue Truck -- Judah didn't become attached to this book until recently (around 20 months) but it has always been one of my personal favorites. Now he loves it! 14. 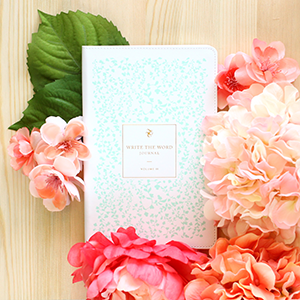 I Love You Night and Day -- Such a sweet book that we especially love to read at night. 15. There's a Wocket in My Pocket! -- Judah thinks this book is SO funny. 16. Snap! Snap! Guess the Animal! -- This is a lift the flap book, but the flaps cover the whole page which makes it quite dramatic when you open them. 17. Little Zebra (finger puppet book) -- There is a whole line of these finger puppet books that are so cute and fun. 18. Things That Go -- This covers such a wide range of vehicles with great pictures. 19. Baby Sophie la girafe: First Words -- A sweet lift the flap book. Judah learned all the words in this book very quickly although some of them are definitely European terms (like "brick" instead of "block"). 20. The Jesus Storybook Bible -- The only one on the list that isn't a board book. This is usually what we read from every day at breakfast. I look forward to it every time because it helps ME spiritually! SO GOOD! Happy book shopping! This is not an exhaustive list by any means, just some of our favorites. Feel free to leave some suggestions for us too! This past year we received some amazing Christmas and birthday gifts for Judah that he's used all year long. He was 9 months old when he received them and still loves them at 18 months. Great toys that hold his interest and cultivate learning have been key especially since we've had baby #2. I've been recommending these items to friends, so I figured I'd compile them here on the blog! These are perfect for either gender. 1. Beatbo -- Before you run away from this musical toy, give it a chance. It honestly has some legit sounding dance music -- not your average kids' toy tunes! Our son LOVES it. He plays and dances with it for long periods of time and loves for us to join in. It has alphabet, counting, and color songs, and a button you can press to record your own voice that it autotunes and plays back for you. We keep this in his room and it is perfect when he has room time while I feed the baby. 2. Alphabet dog -- This dog sings the alphabet as you walk him. If you press the letter it goes through multiple things: the letter, the sound it makes, and a word that starts with that letter. Judah astonished me one day when I asked if he wanted more and he said, "M, more!" I had no idea how he knew that and then I figured out it was because of this dog. Another great toy that truly holds his attention. 3. VTech Sit to Stand Walker -- Judah loved this before he could stand, then used it to pull up and walk around, and now still plays with it even though he's been walking for half a year. 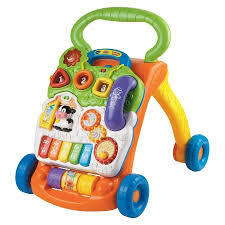 The music can drive me nuts but it has been a versatile toy for multiple age stages. 4. Shape sorter ball -- So this is expensive. But it's the original Tupperware shape sorter ball. The sweet ladies who kept me in the church nursery gifted us this because it was my favorite when I was little. Judah LOVES THIS THING. So much so that I have to hide it or he becomes obsessed. He has learned all the shapes (although he has trouble saying "trapezoid"...but he seriously holds up a hexagon and says "hexagon"...crazy). It was definitely a learning process for him to be able to put the shapes in by himself but we started early and he was hooked. Most shape sorters have lids that can be taken off but this one doesn't so you're forced to actually put them in the specific shape holes. 5. Stacking bowls -- He stacks them. He rolls them. He spins them. He makes them into balls. He hides the small ones in the big ones. He has loved these for at least a year and the love hasn't faded. 6. Counting basketball goal -- This is the updated version of the one we have because I can't find the old one. Ours doesn't have a soccer goal and is less fancy. But besides being such a fun toy, this has truly helped Judah learn to count. And has also made him think that the number 10 is always one to be celebrated. 7. Classic blocks -- Judah will sit and study these blocks for long amounts of time. He loves finding certain letters and looking at the pictures. 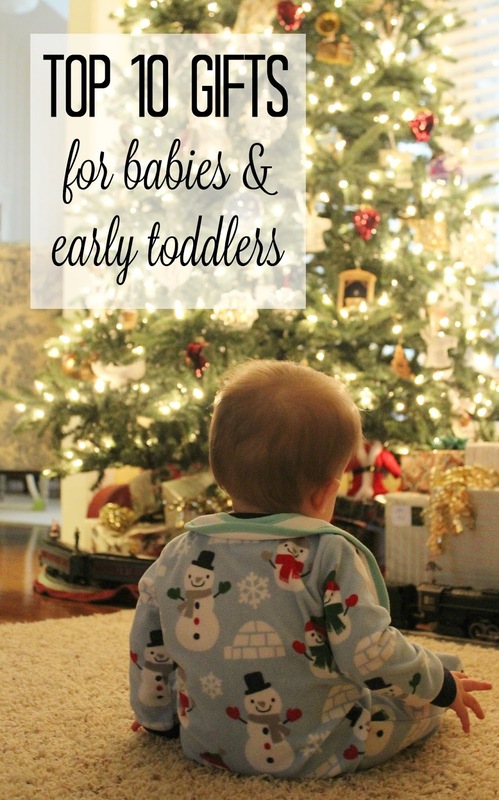 And then of course they are perfect for building towers and working on fine motor skills! 8. Flash cards -- There is a series of these cards and we have the First Words and the Counting ones. It has helped him learn all the words and he also simply loves taking them out of the box and putting them back in. 9. Bath basketball -- Judah's favorite bath toy! 10. BOOKS! -- This deserves a post of its own because there are SO many that we love. 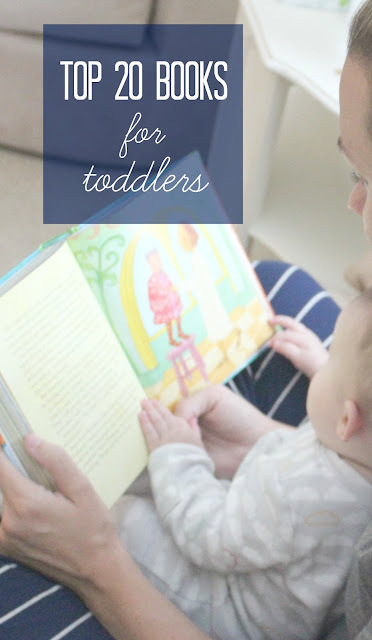 (EDIT: I made a post of our Top 20 Books for Toddlers! Yay!) Last year Jordan and I only got Judah a tote bag (see below) and some books. We knew the grandparents would get him toys! Some of our favorite books off the top of my head are Goodnight Moon, Chicka Chicka Boom Boom, Go! Go! Go! Stop!, The Going to Bed Book, The Very Hungry Caterpillar, any ABC books, Where's Spot?, and goodness if your kid doesn't have the Jesus Storybook Bible go get that RIGHT now. :) Usborne Books is an awesome source for books as well -- you can go to my friend Abby's site to shop there! *Honorable Mention* -- Lands' End Large Zip Top Canvas tote bag -- I got the idea from Hayley Morgan's post about getting each kid a tote bag for their first Christmas. This is really more for us right now, but will hopefully last a long time for Judah to use for years. I already have Levi's as well! *Disclaimers* -- I think experiences are amazing gifts as well and I definitely don't want you to fill your house with toys! These are just ones that are tried and true for us and I'm glad we have. Some affiliate links are used, but as always the opinions are totally my own!